Before we move forward with this blog, I wanted to share some of my initial thoughts on sustainable fashion. What does sustainable fashion mean to me? It's clothing or other fashion accessories that were manufactured in a way where it caused no harm to the environment, people or community. There are things about sustainable fashion that I love, that inspire me, and that I can get behind while there are other things that I don't like. What don't I like about sustainable fashion? Well, first of all, I don't like why it's a "thing" to begin with...why it's needed in the first place. The first conversation that I ever had about this kind of topic: my sister was telling me about her friend's husband living a completely vegan lifestyle which meant eating vegan food AND wearing vegan clothes. Prior to that, I had never really thought about how my clothes were made. Piquing my interest, I started doing research on vegan fashion when I stumbled upon the Netflix documentary The True Cost. Whoa! I don't want to give too much away but basically the film is a deep dive into the world of fast fashion. Dumbfounded at how much the fast fashion industry negatively effects the environment and people, it made me pause and reflect. Then came a slew of emotions. Enter the guilt trip. As I thought about the clothes that I already owned, I asked myself, what the heck have I done? Did I support unethical treatment of workers and help pollute the Earth? Next, I felt a little overwhelmed and confused. What brands or stores should I trust? And it's not even good to donate your clothes because developing countries are inundated with our donated items?! So, I have decided to take one step at a time and try to be as well informed as I can. Not wanting to add to the damaging effects of fast fashion, I decided to make changes to my purchasing habits. Why do I love sustainable fashion? It gives a sense of purpose. I love the idea that sustainable fashion is beautiful while helping people and the planet. I'm inspired that more fashion and clothing companies are incorporating sustainability into their business. Some are even donating profits to charitable organizations. I am also amazed at the innovation and creativity that it brings. Fashion designers are recycling, upcycling or repurposing materials, considering all aspects of the supply chain and producing products ethically. There are fast fashion companies with eco-conscious collections like H&M (Conscious Collection), Zara (Join Life), Mango (Committed Collection). While it gives me hope that sustainability is on the radar for these types of companies, part of me is not that convinced that this is their main focus. My sister and I visited at H&M separately in different locations. Both of us asked the store associates where the Conscious Collection was and were told that they were scattered throughout the store. My sister said, "I just wish they would highlight their conscious collection in a separate section." I agree. Why don't they? It seemed odd to me. But hey, it's a start I guess. And it's better than doing nothing at all! 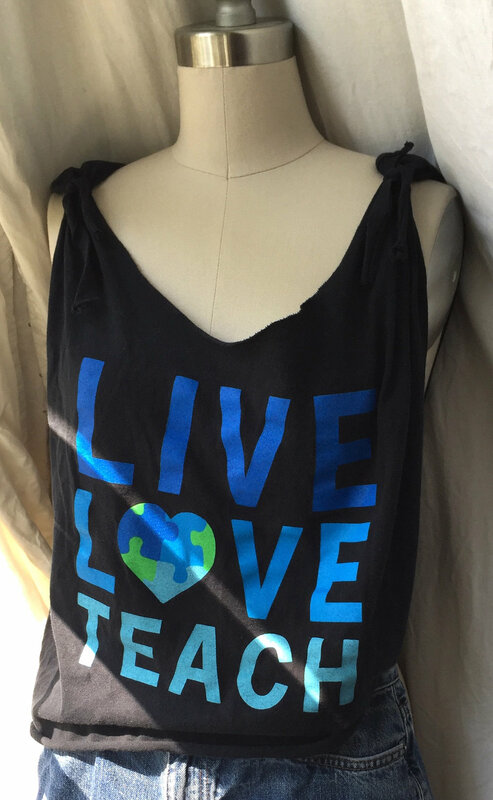 An attempt to repurpose an Autism Awareness X-Large t-shirt into a cute tank. Research and find more sustainable and ethical fashion brands that align with my beliefs and that I feel comfortable buying from. Check out local second hand shops. Challenge myself to recycle or repurpose clothes and materials. (This will be fun!) Here is one of my first attempts. This is one of my husband's old t-shirts that he considered throwing out. Looking for how-to's on Pinterest, I turned this baggy t-shirt into a tank which I've worn over my swimsuit as a cover-up. As I said at the start of this post, these are my initial thoughts which will probably develop as I continue on this journey. More to come on that! Any sustainable fashion brands that I should check out or ideas on how to repurpose clothes? I'd love to hear in the comments!